Why does Unilogic force me to update the firmware on the PLC even to just upload from the PLC? I'm trying to make a small change (ethernet IP scanner IP addresses) and when I try to open older version of unilogic it won't let me create a blank program to be able to go "online" and upload. So I go to newer version of Unilogic and create a blank program try to go "online" an it tells me I need to update the firmware on the PLC. Has anyone ever considered backwards compatibility??? This program was created less than 7 months ago. I don't understand this. I have multiple versions of UniLogic on my computer. I can open any version and create a blank project. 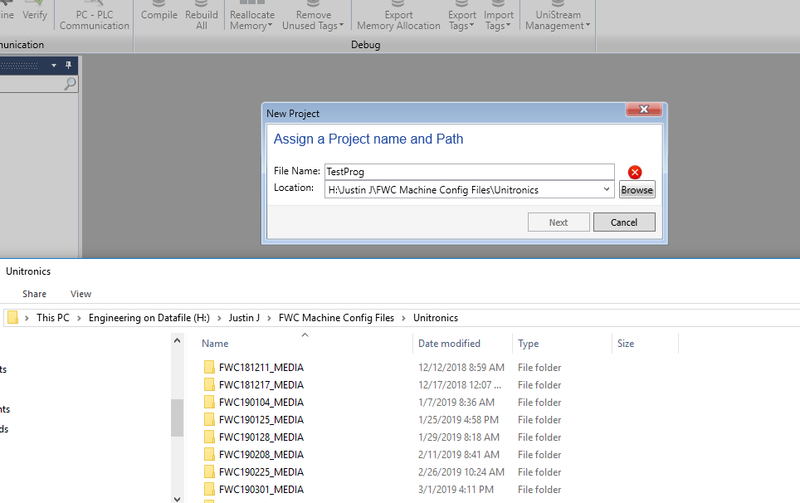 a blank program﻿ to be able to go "online"
UniLogic does require the actual identical project file to what is in the PLC in order to go online. Just make sure you have that and the actual version of UniLogic that the file was created with. Not sure but I get a Red X, when I tried to change it to C : it went away but I was connected to the drive as shown in the picture below. I ended up running into all kinds of problems trying to update the firmware. "identifying hardware" death loop when trying to connect over USB, "failed Update" when updating via DOC formatted to FAT32. I ended up giving up with trying to update and just downloaded the old version of the software then uploading, making the changes, and re-downloading. I just don't understand how you cannot even connect to a PLC with older firmware to grab the program off it. Using any of the connection methods PC-PLC communication etc. Unitronics does not play well with networked drives. Try copying locally first.